Stunning, well made Music Storage Cabinet with sheet music drawers, made in the USA by the Schaff Piano Supply Co., a highly respected leader in the piano industry with a history dating back to 1868. Handcrafted construction of Solid Black Cherry Wood. 10 drawers with solid brass handles. Bottom drawer is twice as deep, for storage of books. 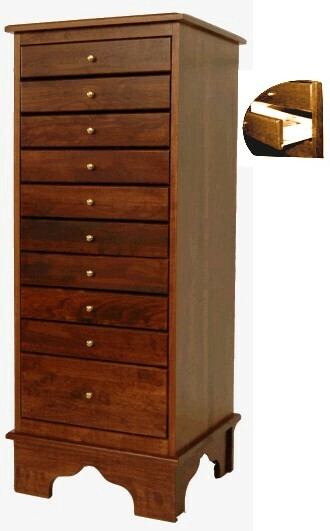 Available in Ebony, Mahogany, Walnut or Cherry Satin finish. Shown above in Cherry. and may be about 3 to 4 weeks before they are ready to ship.